How can I tell if my dachshund is the ideal body condition? Ideal body condition / weight is when you run your hands over your dachshund you can easily feel the ribs, spine and pelvic bones underneath their coat and soft tissue, but they are not visible to your human eye. Another good way is if you can see a visible waistline behind the ribs when viewed from above, and a slight abdominal tuck when viewing from the side. This is considered the breed standard when it comes to good conformation, great shape and body condition. On the contrary if you are able to clearly see the ribs, spine and pelvic bones, then your dachshund is not getting enough to eat. You probably won’t be able to see any fat on his bones either and there could also be some loss of muscle mass. This is when you need to consider increasing the caloric intake to ensure they are getting enough calories for their activity. 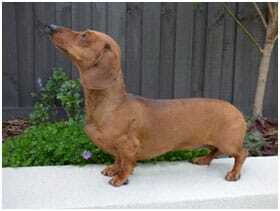 Every dachshund is an individual dog and they do all come in different sizes. However, no matter what size they are it is important that they stay within good body condition, with adequate muscle mass. This is achieved by keeping them a good weight for their size, in conjunction to their level of exercise and activity. 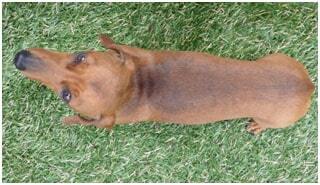 These images above are of a pet dachshund that shows good body condition, tone and muscle mass. Note the slight abdominal tuck in the side view and the visible waistline when viewed from above.